Our T-Ball & Baseball Ministry will provide an opportunity for underprivileged children to learn a sport as well as values for life. “Is that the REAL Fredbird? !” Oh yes, it was!! Wide-eyed kids looked at Fredbird in awe as he surprised the players and volunteers on our CAC East St. Louis T-Ball ministry site on Saturday, May 28, 2016 . This is the second year that our church has partnered with the Redbird Rookies program offering an opportunity for underprivileged children to learn the sport of T-ball as well as values for life. Our eighteen volunteers serve throughout the summer program. 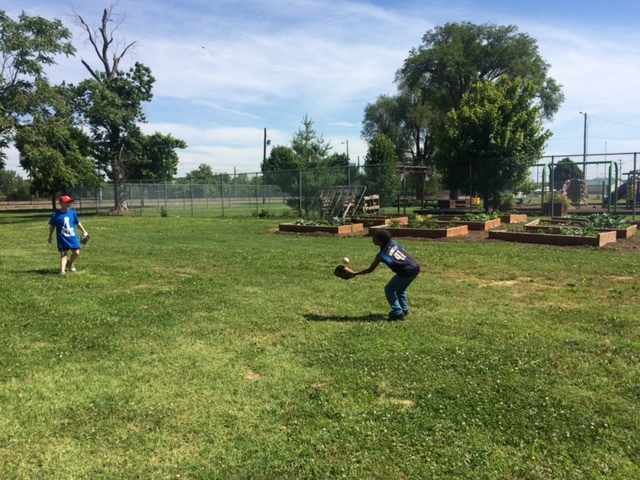 The T-ball program is offered on Saturdays for six weeks. Once the kids step onto the field, they put on their Redbird Rookies uniform, grab a glove, and warm up with a friendly game of catch. After the warm-up, it’s time to play ball! Our volunteer team teaches the players basic skills that are needed to play the game; as well as encourage and cheer them on along the way. A team huddle wraps the game where our team leader leads them in a kid-friendly Bible Study time and prayer. If you are interested in serving during the 2017 season or want to know more please sign up below.